﻿ 2 Peter 3:13 But based on His promise, we wait for new heavens and a new earth, where righteousness will dwell. 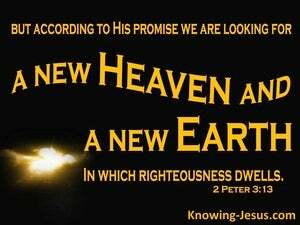 But in keeping with his promise, we are looking forward to new heavens and a new earth, where righteousness is at home. But we anticipate a new heavens and a new earth according to his promise, in which righteousness dwells. 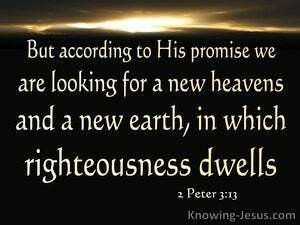 But we look for new heavens and a new earth according to His promise, in which righteousness (uprightness, freedom from sin, and right standing with God) is to abide. But, since God has promised it, we look forward to new heavens and a new earth, where righteousness will prevail. But we, according to his promise, look for new heavens and a new earth, in which dwells righteousness. But having faith in his word, we are looking for a new heaven and a new earth, which will be the resting-place of righteousness. As for us, in consequence of his promise, we expect a new heaven, and a new earth, where justice shall reside. But we, according to his promise, expect new heavens, and a new earth, in which dwells righteousness. But, according to his promises, we are looking for new heavens and a new earth, wherein righteousness dwells. In fulfilment of his promise we expect new heavens and a new earth, where uprightness will prevail. Nevertheless we look for new heavens and a new earth, according to his promise, wherein dwelleth righteousness. Nevertheless we, according to his promises, wait for new heavens and a new earth, in which dwells righteousness. But we expect new heavens and a new earth, according to promise, in which dwells justice. But according to his promise, we are waiting for new heavens and a new earth in which righteousness resides. But according to His promise, we look for new heavens and a new earth in which righteousness dwells. 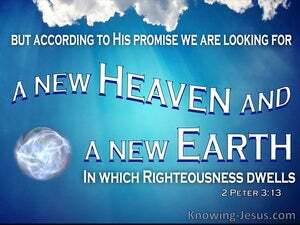 Nevertheless, we look for a new heaven, and a new earth, according to his promise, wherein dwelleth righteousness. It is new heavens and a new earth that we expect, as He has promised, and in them dwells righteousness. But according to his promise, we are looking for new heavens and a new earth, in which righteousness makes her dwelling. But, according to his promise, we are waiting for new heavens and a new earth, in which righteousness truly resides. But, according to his promise, we look for new heavens and a new earth, in which righteousness dwells. But we, according to his promise, look for a new heaven and a new earth, in which dwells righteousness. But, new heavens, and a new earth, according to his promise, are we expecting, wherein, righteousness, is to dwell. But we expect according to his promise new heavens and a new earth in which dwelleth righteousness. but we look for 'new heavens and a new earth,' where righteousness shall have its home, in fulfillment of the promise of God. Nevertheless we, according to his promise, look for new heavens and a new earth, in which dwelleth righteousness. But in accordance with His promise we are expecting new heavens and a new earth, in which righteousness will dwell. In accordance with His promise we are expecting new heavens and a new earth, in which uprightness will have its permanent home. But we, according to his promise, look for new heavens and a new earth, in which righteousness dwelleth. 12 as you wait for and earnestly desire the coming of the day of God, because of which the heavens will be on fire and be dissolved, and the elements will melt with the heat. 13 But based on His promise, we wait for new heavens and a new earth, where righteousness will dwell. 14 Therefore, dear friends, while you wait for these things, make every effort to be found in peace without spot or blemish before Him.